I mostly use syncthing to back up and keep my photo library in sync. I’m a Lightroom user, which means I have a “catalog” that contains a database with metadata about photos, and previews/thumbnails etc. This catalog lives on my laptop, but it would be really bad if it got lost or corrupted. The catalog only ever gets changed on my laptop, so that folder is set to “Master” on the laptop. The “Photos” folder is fairly large (~500 GB) and changes only rarely – and then only to add new files, mostly. Hence I’ve set the rescan interval to 86400 (one day, in seconds) to minimize the disk thrashing. The connection between the two file servers is ADSL, less than one Mbps upstream, so delaying things by up to a day is fine anyhow. For the moment I’m keeping all the RAW photos on my laptop as well but it might change in the future. The laptop could either be at one the first house, the second one or even another place. I saw in another topic that you are using ZFS as well. I like ZFS snapshots that make the files resilient to ransomwares and quickly recoverable. I would love to have some details if you are still using this configuration. For the moment my catalog and my photos are simply synced (via Syncthing) to two Windows computers that have some free space. The lightroom and photos folders are synced, photos in send-only mode, to a couple of other servers for backups. 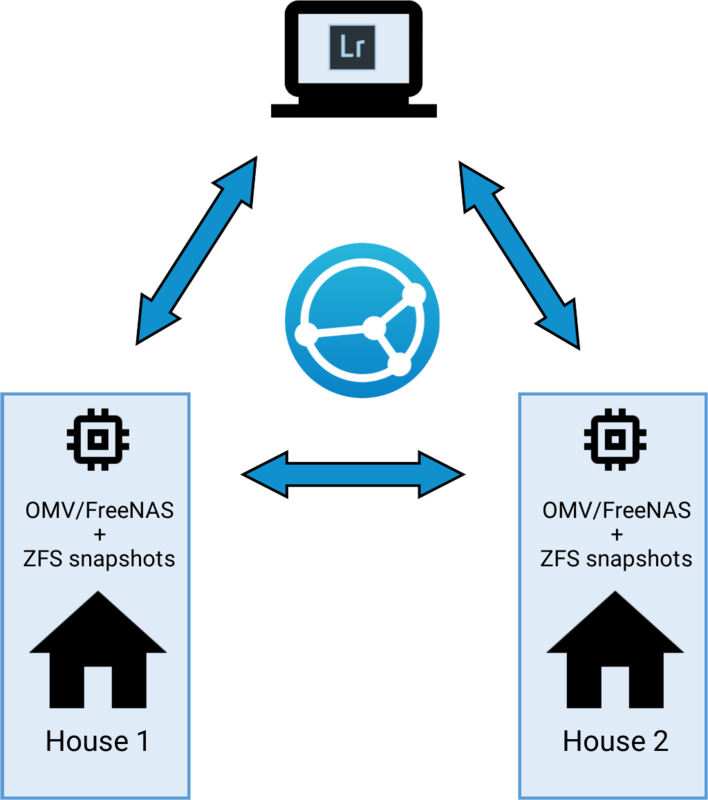 Each server does periodic ZFS snapshots (12 × every five minutes, 24 × hourly, 7 × daily, 4 × weekly, 12 × monthly). The laptop has the 2017 photos locally and sync those to the server using the photos-2017 folder, and the lightroom folder. The older photos I mount over SMB when needed. So this is the dreaded “nested folder” setup but there is no issue with it as far as I’m concerned. The one caveat is that things synced onto the server via the photos-2017 folder won’t be synced to the other servers via the photos folder until they are picked up by a rescan on the server. That’s fine. After importing and playing around on the laptop I usually open the Syncthing GUI, hit a rescan for good measure (it’s set to a slow rescan interval and I don’t have inotify), and make sure things look green. Servers one and two are right next to each other, and server 3 is in another country, so there is no need to make the topology more advanced. @calmh Do you think that using Syncthing continuously with one minute re-scan intervals can have a more than negligible effect on disk life? I have no idea, really. However I would guess that either you don’t have a lot of other disk IO, and then it will all be cached between scans, or you have a lot of other disk IO and Syncthing doesn’t matter in the equation. It is fascinating to read other people’s stories. In my case I take many photos both on my DSLR and my smartphone, managing them in Shotwell on Ubuntu. I needed a way to easily move photos from phone to Shotwell in Ubuntu. To this end I run Syncthing on my smartphone so that all photos are automatically transferred to my Ubuntu machine where I import them into Shotwell. I also track my trail running on my smartphone. These .gpx tracks are also automatically transferred to my Ubuntu machine for analysis and archiving. Next up is to run Syncthing on my Raspberry Pi 3, using it as a backup server.